Eleven hikers joined hike leader, Barbara Martin on a foggy day in Shenandaoh National Park to hike the Jones Run, Doyle River loop. We were graced with three newcomers to the group: Tora Powell, Heather Penington and Patricia Plishka. Long time members, C J Woodburn, David Crowe, Pete and Bev Fink and Brian Muszynski were there, as well as Gabriel Garnetson, Art Bykonen from Richmond, Tony Alimenti and Dan Funkhouse. While it was drizzly it was a great day for a waterfall hike. The falls were gorgeous with lots of water tumbling down. Much fun was had by all. 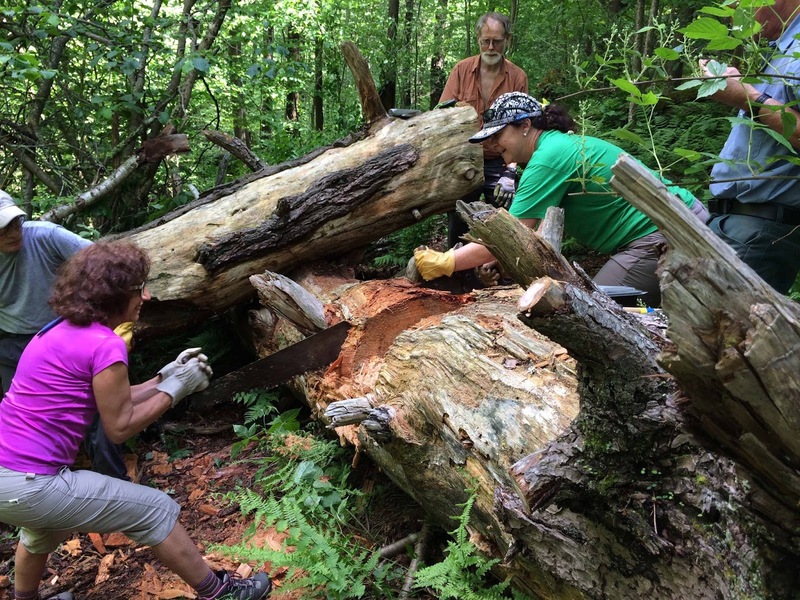 The Southern Shenandoah Valley and Charlottesville Chapters teamed up on June 4 to celebrate National Trails Day and work on a remote but popular trail deep in the heart of Ramseys Draft Wilderness. What was once perhaps the largest tract of old growth hemlock in Virginia has succumbed to the wooly adelgid. Nearly all of the giants have been killed. 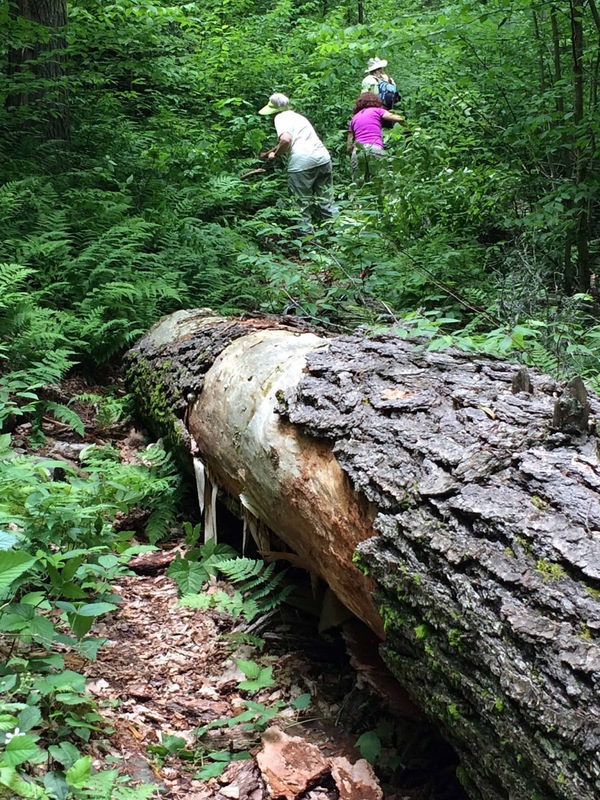 Some snags are still standing, but many have fallen across Ramseys Draft Trail which runs through the center of the 6,600-acre federally-designated Wilderness. In addition to the down hemlocks, the undergrowth had become overgrown, as often happens when more light reaches the forest floor. 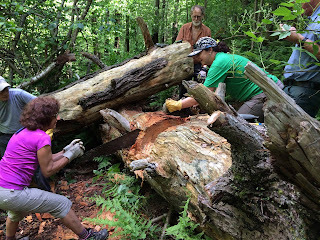 Having heard reports that upper Ramseys Draft Trail was nearly impassable, SSVC and Charlottesville chapters planned this joint worktrip to cut out some of these blowdowns and clip back the overgrowth. 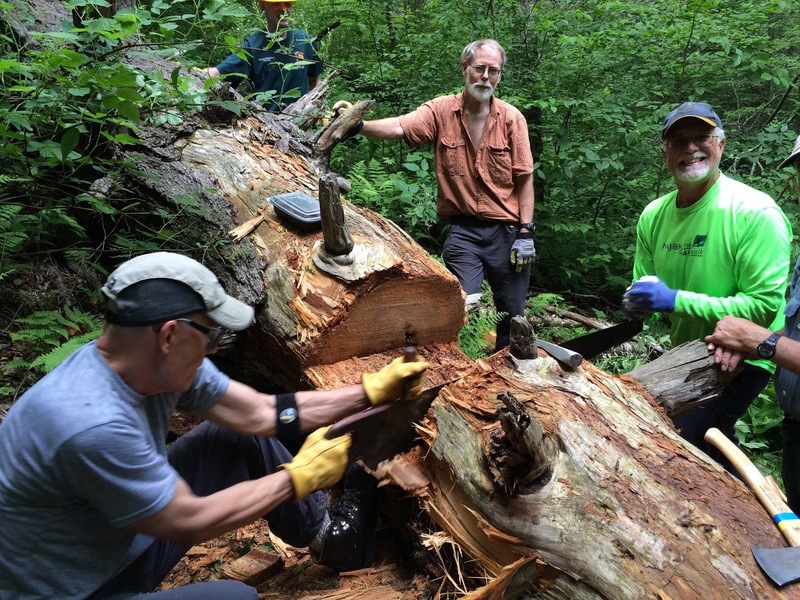 The North River Ranger District of the George Washington National Forest supported our volunteer efforts by sending two of their staff with a chainsaw to cut blowdowns outside the Wilderness area. Five SSVC members who have worked on Ramseys Draft trails several times this spring packed up their Coronas, a crosscut saw, and a 25 pound come-a-long and got an early start from Camp Todd. We hiked 3 miles to Hiner Spring and then began working downstream on Ramseys Draft Trail. With a much longer drive from their meeting place Debra Fisher, John Shannon, Bill Holman, Karen Siegrist, Tony Alimenti, Ivana Kadija, Barbara Martin, Marian Styles, Iva Gillet, Rich Bard, Lisa and Nick Auwarter from the Charlottesville Chapter arrived at Camp Todd a little later and hiked up the mountain to Hiner Spring with clippers, loppers and saws. 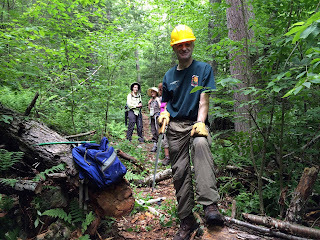 This was Ivana, Barbara, Lisa and Nick's first trail work hike. About half of the group stopped en route to work on the badly overgrown Hiner Spring Trail, while others caught up with SSVC just in time to lend a hand on cutting a step-through on a giant down hemlock that had been very difficult for backpackers to cross. 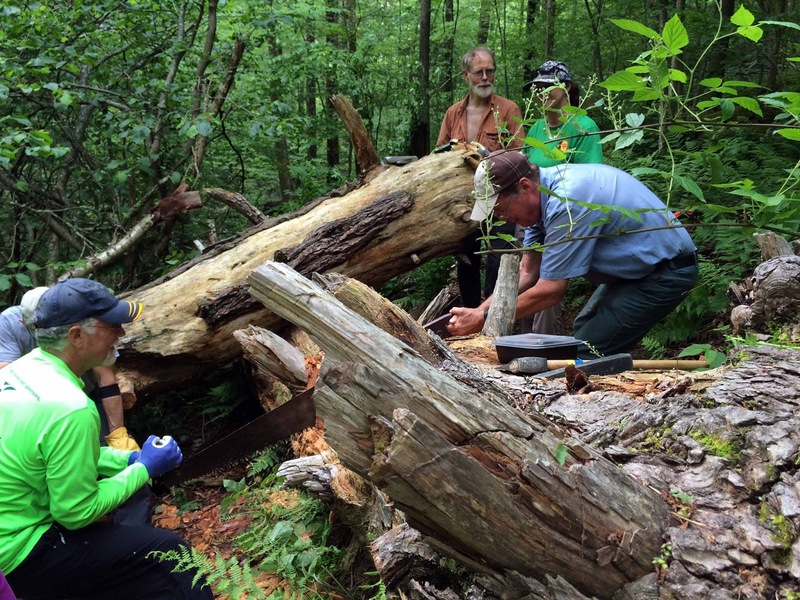 Cutting and chiseling out the step-through gave just about everyone a chance to try their hand at the crosscut saw. It was too large to cut completely with any of our tools, but the step-through helped significantly. With a grim forecast for flash flooding later in the day and a long drive home, the Charlottesville group headed back to the cars, only to be caught in torrential rain. 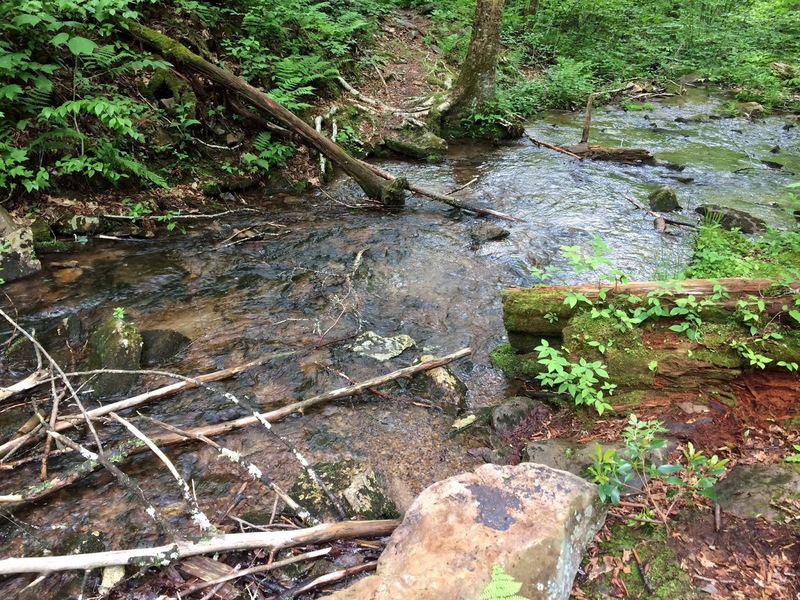 The streams rose quickly, flooding FR 95, the only access road to the trailhead. 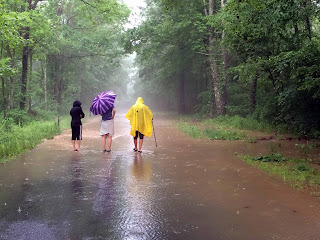 Fortunately, the road was passable with only a couple of inches of flooding water. The SSVC group worked a little longer until the rain began, then hunkered down and waited out the worst of it. We realized later how lucky we were when we read that communities north of Harrisonburg got 4.5” of rain the same afternoon. To make a long story short, both groups were soaked to the bone and opted to skip the planned gathering at a brewery in Staunton in favor of a shower and dry clothes back home. Charlottesville members were able to stop at Blue Mountain Brewery on the east side of the Blue Ridge for a early dinner on the way back to Charlottesville. 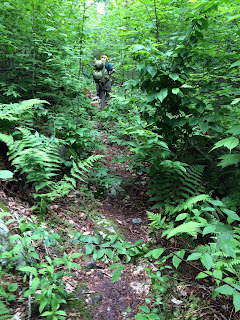 Despite the wet end to the day, we accomplished a great deal on the most remote part of Ramseys Draft Trail, which draws hikers and backpackers from the entire mid-Atlantic region. Hopefully our work will make future visits a little more pleasant. 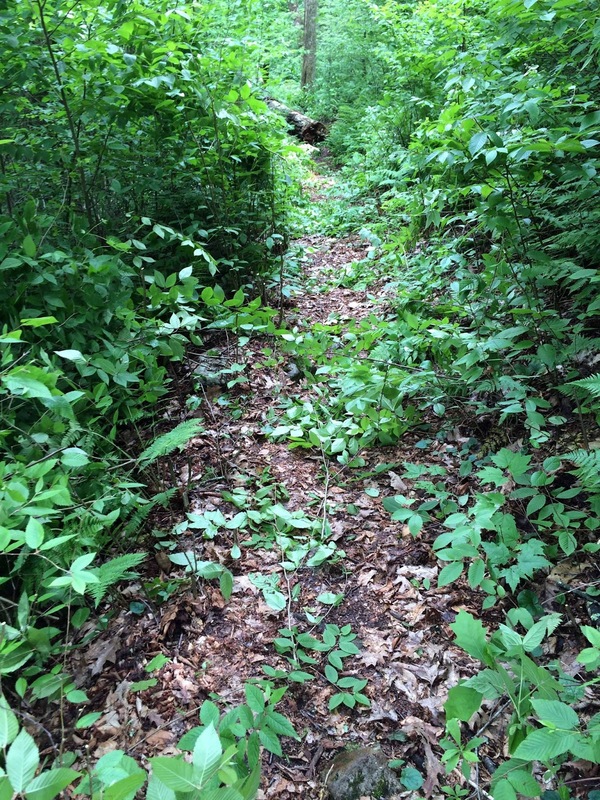 SSVC plans to work more on Ramseys Draft Trail this fall. We lack about 3 miles in the most remote part. If anyone in PATC is interested in lending a hand, we would welcome your help. 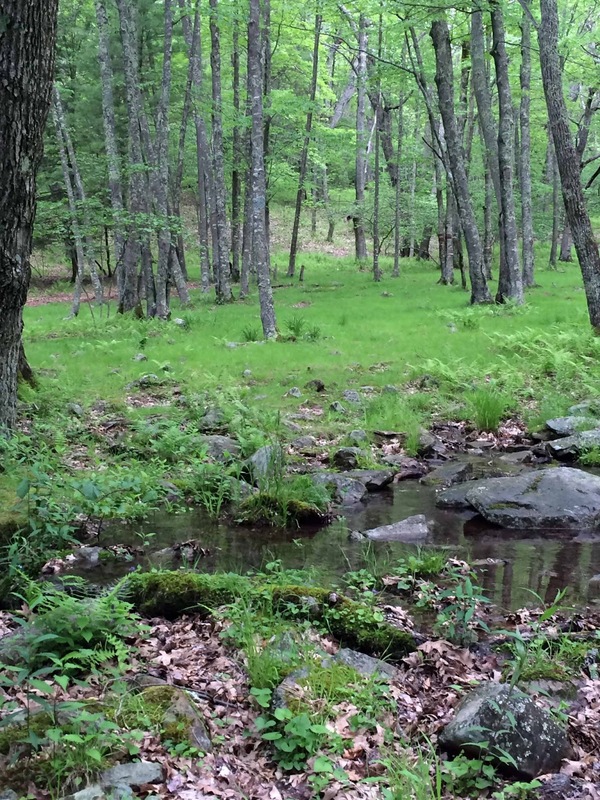 June 18 was set for a trail work and hike day at the Vining Tract below Shenandoah National Park in Greene County off of Route 33. 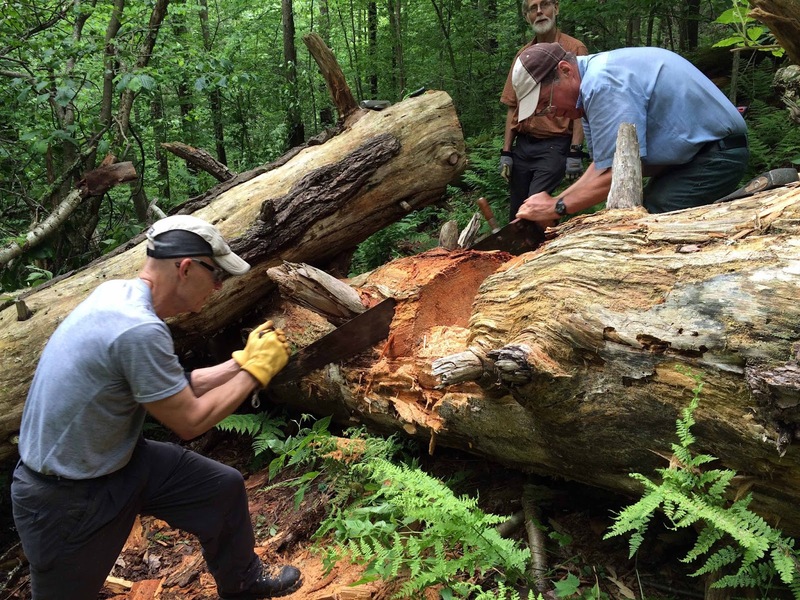 It is the site of six PATC cabins and nearly 10 miles of trails maintained by a number of local chapter members - with Bill Holman serving as District Manager of Mutton Hollow. Seven volunteers met up and duties were divided. Bill did chain saw work mainly on the West Boundary Trail. Mark used the Death Wand (Wanda) to weed whack the Vining Trail and Conley Trail. Geoff Manning-Smith line trimmed the West Boundary Trail. Marit (hike leader) with the contingency of Claire, Dave, and Gabriel did a perimeter hike to inspect the trails for blow downs and did light trimming with loppers and pruning shears, as well as small blow down removal/sawing. 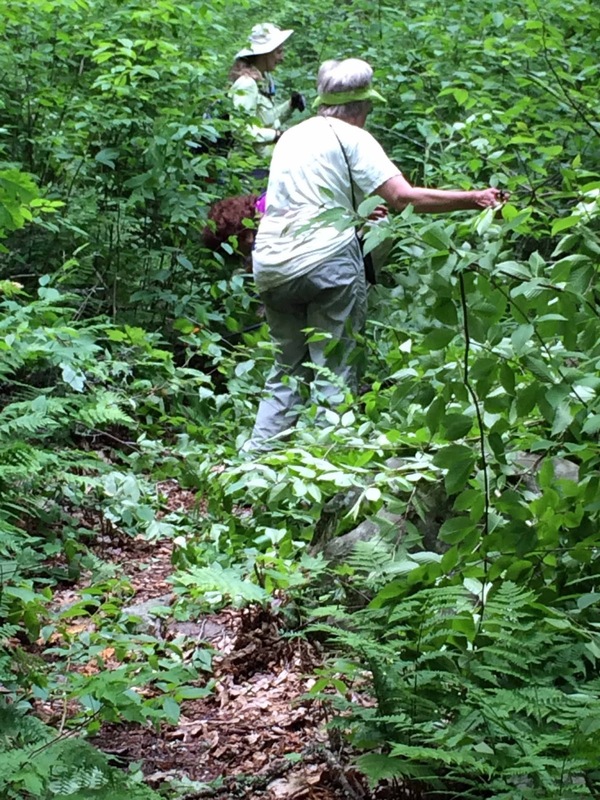 The trails inspected included East Boundary, West Boundary, Mutton Top, Cliff, Mattie's Run, Vining, Conley, and Boxwood. 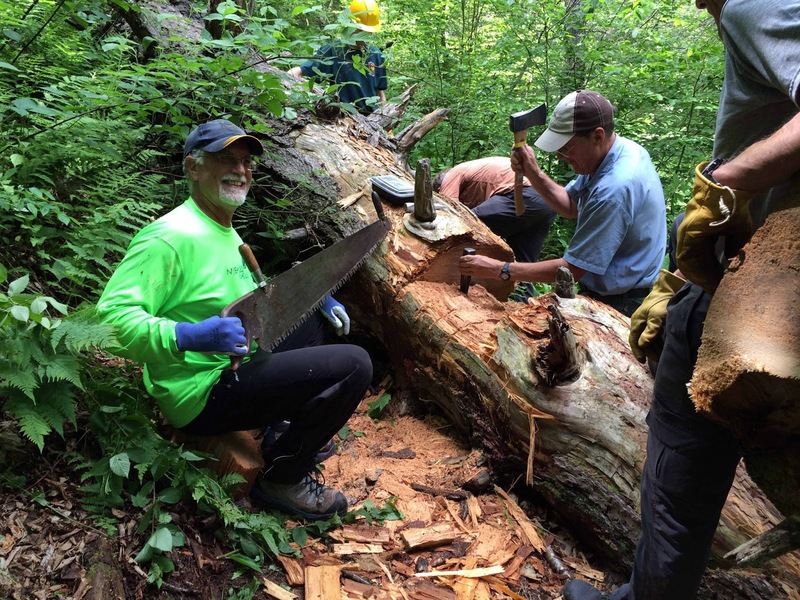 The group covered over 6.5 miles with 2,200 elevation gain working from 10:30 am to 4 pm. At the end of the day everyone met up at Butternut Cabin, which is the overseer cabin, to turn in tools, have a beer, and discuss the day's accomplishments. 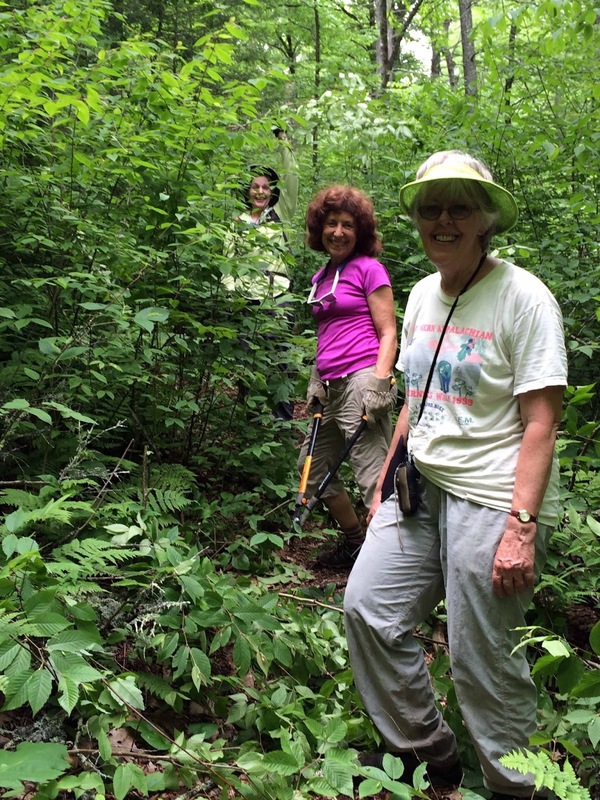 Iva Gillet returned from a day manning the PATC booth at a Shenandoah National Park event. 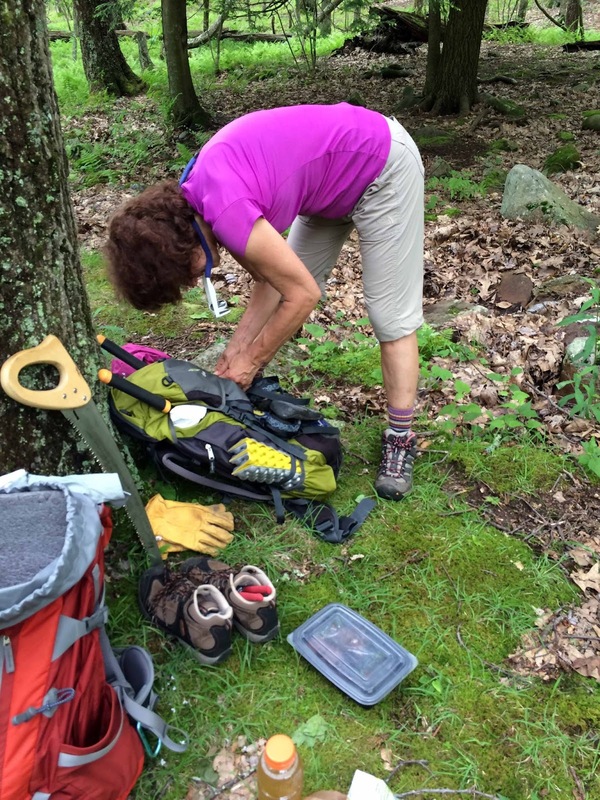 Some volunteers returned home and others stayed to enjoy a cookout and overnight at the cabin. Looking forward to another similar event in the fall. Thank you volunteers! Dave next to the bear clawed trail sign- yikes! Claire at the Johnson bathtub...one of the many features of the area! 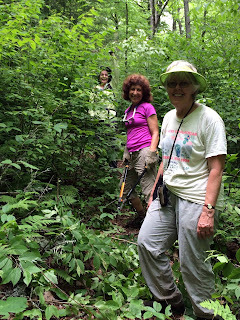 Hot and humid - perfect day to spend hiking down from the Blue Ridge Parkway to Sherando Lake. Eleven hikers united at White Rock Gap parking area and descended via the White Rock Gap Trail to Slacks Trail with a big push down Torry Ridge. 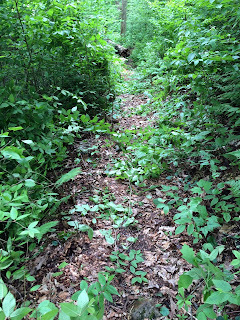 We saw a toad, a small snake, mountain laurel still in bloom, and lots of butterflies. We skirted on the Lakeside Trail and ended up beachside on a patch of shaded grass. A number of the group took a refreshing, cool swim in the lake as we ate our lunches and chocolate chip cookies. 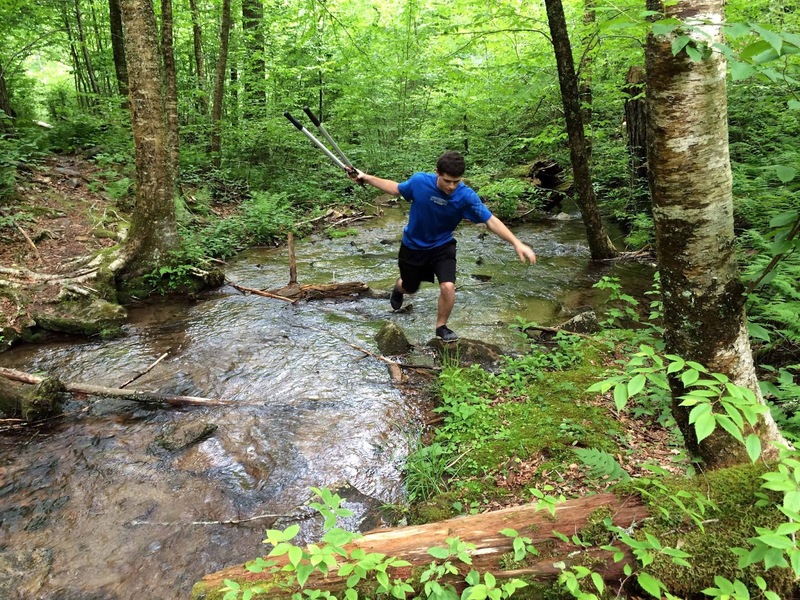 Since it was Free National Park Day we had many folks sharing the recreation area...glad so many were out to enjoy the beginning of summer vacations. 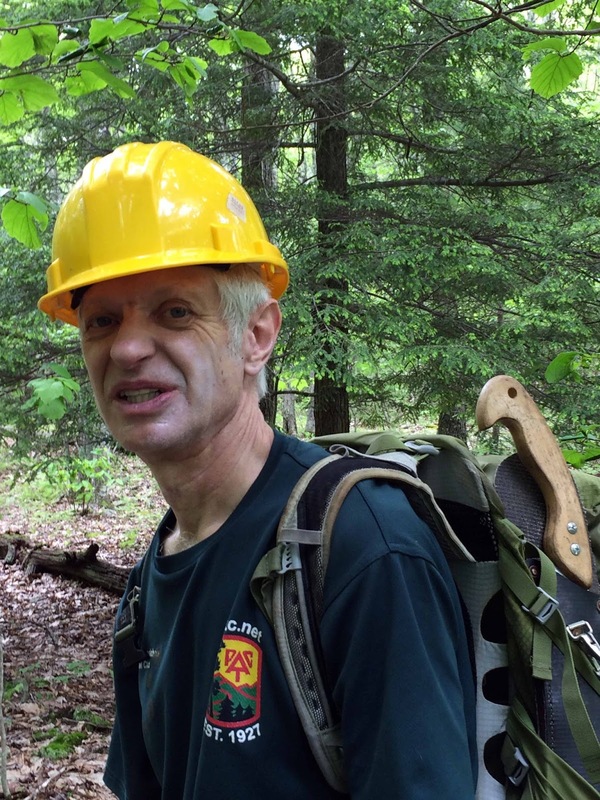 The return trip for most was up the White Rock Gap trail, as well as some hikers walking the lake trails as they waited for a shuttle. We reconvened at the parkway and three members went to Devils Backbone Brewery to partake in a much wanted beer. 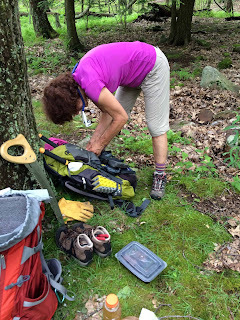 The mileage ended up being quite a bit more than the estimated 7.5+, with total closer to 10+, but the hikers did not seem too upset with Marit as many of them are training for upcoming treks in England, Glacier National Park, the Alps, and the Colorado Trail. Thanks for being so understanding...everyone got lots of exercise and fresh air! A crew of two hikers braved blue skies, warm temps, and the threat of a crowded trailhead parking lot on the Saturday, May 29 Memorial Day Weekend Charlottesville Chapter hike. After nabbing the last legal parking space, Dan Funkhouser and “Dan’s personal hike leader” Jeff Monroe explored the entire Staunton River Trail and the Graves Mill Trail, along with some shaded fire roads connecting the two trails. 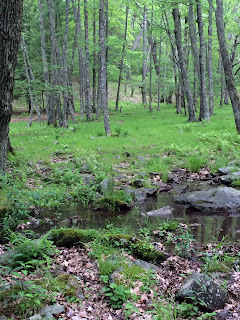 This part of Shenandoah National Park was alive with flowing streams which, despite the day’s heat, made for a refreshing day on the trail. 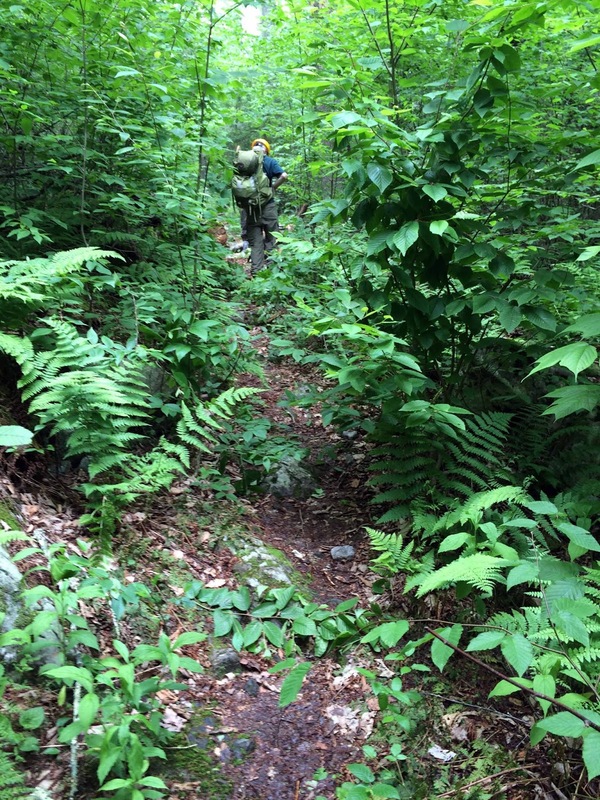 The hike totaled 12 miles with 2000 feet elevation gain, and the hikers were back in town by 4 PM.